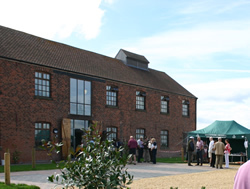 The Willow Works Community Group was formed to act as a liaison body between the Beckingham community and Groundwork which owns and operates the Willow Works. The group is a sub–group of the Beckingham Parish Council and its meetings are, therefore, open to all members of the community. Meetings are held four times a year and dates of these meetings will be published on the Beckingham web site. The AGM will be held at the March meeting. Details of the aims and responsibilities of the group are given in the constitution (download PDF here). Current activities of the group include continued involvement in the development of the community field to the west of the Willow Works. The area now has a demonstration willow plantation now producing material suitable for willow working, two ponds and various interpretive display boards. These provide opportunity for various educational activities many aspects of willow cultivation, cropping and working; nature study (the importance of which has, much belatedly, been recognised and is included in the school curriculum). These educational activities are for students of all ages and can be worked in conjunction with the adjacent RSPB Beckingham Marshes nature reserve. Group members include representatives of various parties with an interest in the project including the RSPB and the Beckingham Village History Group. For more information please contact DickDickinson (roddy.dickinson@btinternet.com).